In the conversation on Reproductive Justice and Birthing Equity, the climate is one of immense urgency. With public breastfeeding now legal in all 50 states as of July this year, there’s a lot of momentum around birth equity, breastfeeding, and the rights of mothers in both the private and public spheres, but with every institutional reform and public shift, the question begs to be asked: Where does this leave Black mothers? In the context of reproductive justice and the history of our communities in this country, the answer is non-extractable from the Transatlantic Slave Trade and the practice of slave breeding in the Americas. This Black Breastfeeding Week, like many others in the past, meets the crucible forged by white supremacy, medical racism, and heteropatriarchal state violence against the bodies of Black mothers and their children. The history of the controlled reproductive capacities of Black and afro descended women is the foundation on which this country is built. The legacies of terror, oppression, and gendered dehumanization still impact the ancestors of those who survived the vast grief of enslavement. The National Institute on Minority Health and Health Disparities reported in 2017 that 64.3% of Black American parents breastfed, in comparison to 81.9% of Latino and 81.5% of White parents breastfeeding. Now, those statistics can look very different when breaking down the racial variations within the Latino statistic (as people can be both Black and Latino as well as any race and Latino.) The enduring legacies of slavery are part of this equation. As part of her research for a doctoral degree at the UNC-Chapel Hill School of Nursing, Devane-Johnson held focus groups to ask Black women about breast-feeding. She presented her research at the annual UNC-Chapel Hill Minority Health Conference, held recently at the Friday Center. Devane-Johnson described how she recruited 39 women ranging in age from 18 to 89 years old and asked them what conversations they’d had with family members. Turns out, many hadn’t had conversations at all. And then there was the enduring legacy of slavery. “There were some older black women who wanted to disassociate themselves from the past, from slavery and the wet-nursing,” she said, explaining that often young slave women were pressed into giving their milk to white infants. “That image of a ‘mammy’ when people would say that,” reads one of the quotes Devane-Johnson collected from her focus groups. “It did conjure up those pictures of the women feeding the white babies and all that.” And the cultural memory has been passed down even to younger women. “It really was amazing…. In my 18-to-29-year-old breast-feeding group, there was a young lady in there who said, ‘Yeah, the white men used to steal the slaves’ milk,’” she said. Devane-Johnson explained that often slave women had to be away from their own children, at the cost of their own children’s lives. Within the realm of influences that contribute to the comparative low numbers for breastfeeding amongst Black Women are slavery, racism, implicit bias, and discrimination from care/treatment providers. What creates a more nuanced and complex take on this data is also the influence that mental health and personal history have on the breastfeeding parent. 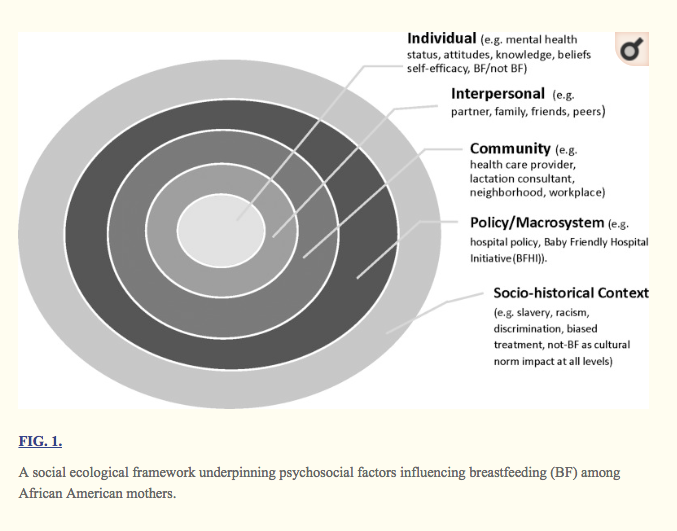 When we consider the material realities and sentiments around mental health that exist inside our community, as well as the structural violence we face, a completely different picture around Breastfeeding is painted. To center the history of these legacies, material realities, and subjectivities, I talked with a Black mother named Christena, who is based in Washington, D.C. and has a two year old son named Thiago. I wanted to center her experience with Breastfeeding, discuss some of the situations, structures and resources she had in place that made her feel supported and NOT supported, and learn what would make breastfeeding a better experience for her and for other Black mothers in her community. Christena has been nursing her baby for two years and counting! She’s a working class mother who has been though the ringer — having been illegally reprimanded for pumping at work, and having nursed through postpartum depression. Hopefully, her truth and her experience dealing with the structural inequalities around feeding her baby and mothering can provide a mirror to support other Black mothers who may be doing really well but need inspiration to go further; or mothers who are struggling with trauma or resource capacities (emotional, financial, and otherwise) and need some honest affirmation in their journey. My decision to breastfeed was both a financial and deeply personal choice. I knew breastfeeding was incredibly important to infant health and it lowers rates of infant mortality. The anxiety around keeping a baby alive and thriving was only slightly eased by breastfeeding. I’m thankful for the connection I was able to establish with my baby through breastfeeding. I left my OB/GYN halfway through my pregnancy and opted with a birthing and family center in my area instead. I didn’t feel supported by my OB and that changed when I switched to midwives. Even then, I felt a little hostility from medical professionals and I can only assume it’s because of my race and low income status. I have a lactation consultant available to me through the birthing center and they offer a lot of help and literature. Outside of the medical structure, I have no support besides my partner. I don’t know anyone that has ever breastfed, so I was met with skepticism from my family. My baby’s birth wasn’t easy and I didn’t feel supported during and labor. The hospital’s lactation consultant was hostile and impatient with my questions. The nurses assigned to me also pressured me to use formula, so I did. There were many times I wanted to stop, but the convenience and zero cost of nursing was a major factor to continue to nurse my baby. I suffered an extreme bout of PPD. I suffer from PTSD from CSA (Childhood Sexual Abuse) and it was really hard to associate a sexualized part of my body with functionality. These are no longer parts of my body where I feel shame, but parts of my body that I feel sort of proud of — I have a healthy, bouncy baby that thrives on my breast milk. I feel so much pride in that. When I had to eventually return to work, I was harassed by management about pumping breast milk at work. I was eventually fired and accused of wage theft over my 15 minute breaks on $2.77 an hour. My experience with breastfeeding has been traumatic, overall— but I’m still nursing my son at 2 years old. I don’t feel ready to stop nursing and he doesn’t seem ready either, so I’m okay with extended breastfeeding. I’ll be ready to stop when he is. I’m hoping to make my next pregnancy and experience with breastfeeding an infant better than my first experience. I wish I had more emotional support and understanding from both medical professionals as well as coworkers and family members who were purely ignorant on the subject. I don’t believe Black women are supported enough to breastfeed. Based on my experience, there are no conversations that are had with us from OB/GYNs or other medical professionals. More importantly, there isn’t access to this knowledge. This inspired me to start a new project to help other mothers. I’m currently working on an app and a website that does the work of mapping out breastfeeding-friendly areas in the DC, Maryland, Virginia area — had I known, I would have ventured out with my baby more. You should be able to feed your baby anywhere you are, but I personally like to know when I’m going to feel safe. That’s where the idea for my project came from. Christena is an essential part of the community we resist for, support, work with and build with to close these structural trenches. Her story highlights a truth that endures over many centuries of life in diaspora. It’s a truth that propelled our ancestors while they endured inconceivable dehumanization. My hope is that other Black parents who are breastfeeding — and struggling to be in congress with themselves through this time of immense repression — can read these words and be supported. This Black Breastfeeding Week, let’s uplift breastfeeding LGBTQ parents, and breastfeeding parents who have postpartum depression, mental illness, or traumas, and aren’t routinely represented in birthing community conversations and support models. Mekha McGuire’s transdisciplinary labor is informed by her work with Black girls as an educator and community worker, as well as her service as an abortion doula and Black birth equity advocate. Her research and organizing is built on ethnographic and Black feminist frameworks that analyze and center conversations around Black girlhood, collective memory, femme genealogies, Reproductive Justice, solidarity politics and intergenerational gendered trauma within the African diaspora. Ms. McGuire is a leader in HealthConnect One’s Birth Equity Leadership Academy (BELA).